The Swivel Sweeper Max is a 360 degree swiveling sweeper that uses quad brush technology to sweep and swivel in every direction as well as under tables and in corners. It includes corner brushes, it uses sliders instead of wheels, and it has a low profile design that keeps it at a low weight of under 2 pounds. The Swivel Sweeper Max's brushes spin at 4,000 RPM and the sweeper can slide and guide on any surface without needing to change settings. It does not have bags or cords; instead, it's rechargeable and can last for 45 minutes on a full charge. It has a touchless dirt tray as well and the bristles can actually be removed and cleaned to keep the sweeper empty of debris. The Swivel Sweeper Max is lightweight and powerful at under 2 pounds and a 360 degree swiveling direction. Its rechargeable so there are no bags and cords, and it can sweep and glide on any surface without needing to change settings like other sweepers or vacuums. The Swivel Sweeper Max has a low profile design and can get under places that other sweepers cant. Users simply empty the touchless dirt tray when it gets full, and the sweeper is ready to go again. It can last 45 minutes on a single charge and is the only sweeper with RCR technology, meaning the bristles can actually be removed, cleaned, and replaced. The cost of Swivel Sweeper Max is $39.98 plus $14.99 shipping. 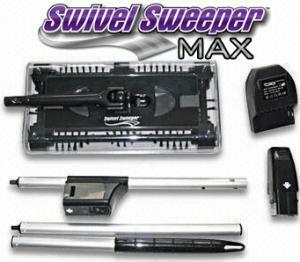 The special TV offer allows you to receive a second Swivel Sweeper Max by paying the extra shipping fee of $14.99 for a total price of $69.96. The Swivel Sweeper Max swivels 360 degrees and uses quad-brush technology to clean in all directions. It can get in corners with its corner brushes and has a touchless dirt tray that can be emptied at any time. Additionally, the brushes spin at 4,000 RPM and the Swivel Sweeper charges up instead of using bags or cords. How do I empty the dirt tray? Simply press on the tabs located on the top of the sweeper. The dirt tray will open, allowing you to empty it without ever laying a finger on the dirt. How much does the Swivel Sweeper Max weigh? The Swivel Sweeper Max is incredibly lightweight at an astonishing 2 pounds. How do I acquire the Mini Sweeper? You get a free Mini Sweeper with your order of a Swivel Sweeper Max. You dont need to change any settings! The Swivel Sweeper Max is so versatile that it works on any type of floor.